Sudbury Hall is a beautiful, brick-built stately home in Derbyshire, England which is operated as an attraction for visitors by the National Trust. It was built in the 17th century for the Vernon family, who still live nearby, but was given to the trust 1967. We fell in love with this house, because it’s so pretty and unlike many of these country homes, it’s actually small enough to imagine yourself living there! Inside the house, there are a number of rooms which will ‘wow’ you, including the upstairs long gallery which stretches from one side of the house to the other and is beautifully illuminated by the many large windows along it. The library is like something you’d find in a movie, complete with two levels of books to exlplore and the kitchen has been left as it was in the early 1900s. You usually find a guide in there, who explains how the family home was run. Part of the hall was used for the filming of the BBC TV adaptation of Pride and Prejudice which made Colin Firth a household name in the UK. There are usually signs up to tell you which room this was. As with many of these houses, we did feel that there’s a lot more to them that you never see. We’d like to have seen teh servant’s quarters on the top floor so we could see how they lived for example. Around the grounds of the house, there’s plenty to see as well, with the former stables and outbuildings housing a separate attraction, the Museum of Childhood. This is deciated to the life and play of children in years gone by and is packed with period toys, some of which you can play with. There’s also the chance to be a chimney sweep or a Victorian pupil in school. The hall’s church is still functioning as the parish church of Sudbury and is nearly always open for visitors. Don’t miss out on having a look around as it’s gorgeous..and free. It’s also free to visit the grounds, shop and cafe, so have a walk down to the lake to watch the ducks. Parking here is free too. 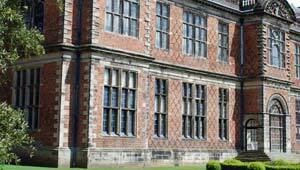 Sudbury Hall is open differing days throughout the year from mid February through to late December, but typically Thursday to Sunday, from 1pm to 5pm. The Museum is open more often from 11pm to 5pm and the grounds are usually open from 10am to 5pm on opening days. Sudbury Hall is just of the A50 route between Derby and Stoke-on-Trent. The X50 bus serves the village from both cities.